Stoner Tuesday Sale 2018!! Buy One Get One 50% OFF!! A bit too much cannabis-infused leftovers and forgot Black Friday? Slept through Cyber Monday? We know how it goes! Welcome to the Stoner Tuesday Sale. Starting now and going on all week long* while supplies last. Buy one and get 50% off your second on all our Tours, Activities, and Classes. Bookings available from now until 4/15/2019. PLUS additional discount when you book a hotel for your stay! Sale available through our sales agents. CALL US NOW or speak with a live chat agent. Good for all locations Denver, California, DC, and Boston. * * Limited quantities of certain items, while supplies last. Some restrictions apply. Cannabis concentrates are as diverse as they are potent. There are so many different types of concentrates, sometimes it hard to keep them all straight. From kief to oils, hashish to shatter, it can be overwhelming to consider trying them, or how to smoke concentrates when you aren’t even sure which is which. How are cannabis concentrates made? 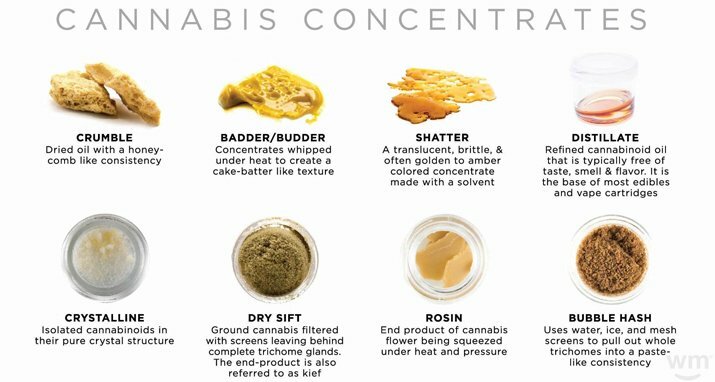 How are concentrates, oils and extracts different? How much do concentrates cost? Solvent-based and solventless marijuana concentrates are products that have been created from the cannabis plant and are much more potent than just flower alone. What is a solvent based extract or solventless cannabis concentrate? Well, some concentrates call for a solvent, such as CO2, butane or alcohol, in order to extract the THC and other valuable cannabinoids and terpenes. If a concentrate utilizes a solvent to be created it is referred to as an extract. Other concentrates require no solvent and these are referred to solventless concentrates. All extracts are concentrates but not all concentrates are extracts. While different types of cannabis concentrates might seem to run together, they are each quite distinctive. There are numerous types of concentrates and extracts and new ones being developed all the time. Kief, hash, rosin, tinctures, oils, shatter, pull and snap, wax, budder or badder, crumble, honeycomb, distillate and crystalline are the concentrates we will focus on. Check out our Colorado Hash Class & Facility Tour Combination! w/ expert extract artist Murphy Murri. Learn about terpene profiles, rosin tech, ethanol extraction, and BHO tech with a behind the scenes tour of KrystaLeaves, extraction and production facility. Kief is the most basic of the THC concentrates. It is a powder-like substance that lives on cannabis flowers. If you own a grinder with a small reservoir at the bottom, known as a kief catcher, you are probably familiar with kief. Hash is, basically, pressed kief or compressed resin. There is finger hash, bubble hash, dry sift. To make hash, THC rich trichomes are separated from the cannabis plant and condensed with high temperature and pressure. It is highly potent. In this Leafly video, you’ll learn the cannabis craftsmanship on how to make hash. Rosin is a sticky substance created when heat and compression meet a bud of cannabis flower. Unlike hash which is made with just trichomes, rosin is made with the entire cannabis bud. Rosin can be made commercially but is also able to be safely and easily produced at home with a hair straightener or t-shirt press. Tinctures utilize decarboxylated cannabis, placed in a jar with a high proof alcohol like Everclear. The mixture is then stored for several weeks, strained and consumed. It remains a liquid, but will be green in color and is spiked with all the good stuff that has been leached out of the plant into the alcohol. There are several different types of cannabis oils, which we will detail in depth in our next chapter. In the meantime be aware the most popular oils are THC honey oil, CO2 extracted oil, BHO extracted oil, distillate and Rick Simpson Oil. When made properly, it is a thicker liquid than a tincture, but viscous enough to not be a solid either. It is more popularly utilized in a pre-filled vape pen and can also be placed inside capsules for oral ingestion. Shatter is a solid substance, which resembles a honey-colored glass shard. When tapped with a dab tool, it breaks into pieces or “shatters,” get it? Shatter is one of the most recognized concentrates, is easy to manipulate and is far less messy than other varieties of concentrates or extracts. Pull and snap looks very similar to shatter but has an almost taffy-like consistency. Instead of shattering into pieces, pull and snap can be…pulled and snapped. As a piece of this concentrate is pulled, it reaches a breaking point then snaps off the whole. It, too, is honey colored. As the name suggests, wax concentrates resemble the texture of candle wax. Depending on the overall consistency it can be known as budder, badder, crumble or honeycomb. Budder or Badder wax is the more viscous wax, which is gooey and can almost be stirred. Crumble and Honeycomb wax have the same consistency but can be in different forms. Crumble is typically used to describe wax that is already broken up, or crumbled. Honeycomb is used to describe wax that is still mostly intact but is filled with holes like, you guessed it, a honeycomb. Distillate is a refined, or distilled, version of a cannabis extract. After extraction, the distillate is run through a purification process several times. The result is a liquid, clarified distillate, much like honey in color and consistency. Crystalline is a solid extract that has been through many processes and filters in order to destroy the plant matter remaining in the extract, preserve the THC and remove any leftover solvents. The remnants are clear crystals that boast 99% THC. How do I smoke a concentrate? You’ll have to wait until Chapter 2 for that answer! What is the price of a cannabis extract? Well, it depends. We are going to be talking averages here because nailing down a universal price isn’t realistic. So you might have seen it go for more, you might have paid less at some point – but for the sake of putting an average number on it, these are the prices we discovered through research. At this price point, you can get a gram of kief, hash or wax. From our research $20-25 a gram seems a pretty customary average for kief. However, you COULD just purchase a grinder with kief catcher and collect your own. Bubble hash can be around $30 a gram, but hash that is a chemically extracted product can cost up to $100 a gram. As for wax, you will pay around $30 a gram, depending on the wax you are choosing. For a little more money, you can get yourself a gram of rosin, shatter, pull and snap, 250-500 mgs of cannabis oil or 32 ml of tincture. Depending on the quality of the rosin, you could pay an average of $45 a gram, with some being less and some being more. An average cost for quality shatter is about $40 a gram. Pull and snap can range between $30-$50, or an average of $40 per gram. A vape pen cartridge filled with oil can be anywhere from $30-$60. If you want hash oil you’ll be looking at around $50 per gram. You aren’t going to be buying a gram of tincture because most likely it is going to be measured in milliliters. 32 ml of tincture can go for about $50. Yes, this sounds a little crazy, but both distillate and crystalline will cost a pretty penny. Users need to use much less at a time than other concentrates to feel effects, both of these products should last you for some time. Because of its high quality and high potency, distillate can go for up to $120 a gram! Wowzers! However, keep an eye out because prices for distillate have been dropping and it can be found for $50 a gram, sometimes even as low as $20 – though you might want to question the purity and quality of such cheap product. For a gram of Crystalline will be anywhere from $100-$200 for one gram, because again, the high quality and high THC potency are going to cost you. “What is the difference between hash oil and THC oil” and more. So now you want to know how to make these oils? Well, you are in luck because continuing onto the next part of our chapter – we explore just how these incredible oils are made and how to consume them. There are lots of ways to do both, make and consume weed oil, and we will do our best to go into as much detail as we can, safely. For example, we aren’t going to draw you a diagram on how to make BHO or Butane Hash Oil because, well, it can be a hazardous process. But we will give you the basics and you can do more research about it if you choose. How are Cannabis Oils Made? As we learned in Part 1, the terms “cannabis oil,” “hash oil,” “marijuana oil,” and even “weed oil” refer to any concentrated extract oil made from cannabis. That includes THC Oil, CBD Oil, Hash Oil, Honey Oil, BHO, CO2 Oil and Rick Simpson Oil. All of these, except for CBD Oil, comes exclusively from the sticky icky kind of cannabis. CBD CAN come from recreational or medically grown marijuana – but it can also come from hemp, which allows it to be sold nationwide (and even internationally) as hemp products are totally legal. In an article from Live Science, Sara Ward, a pharmacologist at Temple University in Philadelphia cautions buyers of cannabis oil about researching quality. We think whether you consume cannabis oil for medical OR recreational reasons, it is important to know how it is made and the quality of said oil. So, how is cannabis oil made? To tell you short and sweet, each oil has a different extraction process but many are available in cartridges to use in your vaporizer. Let’s just quickly get this out of the way. Hash oil is just one of the main words that describes any cannabis oil. For a specific oils process, check out the next subsections in this chapter. Interested in how to make THC oil? It isn’t that difficult at all. A basic THC oil is made with alcohol and is produced by extracting the resin that is in the cannabis plant, the female of the species of course. The resin that is extracted dissolves in alcohol. After that the alcohol evaporates, leaving a thick, syrupy residue. This is your THC oil! The higher the THC percentage in the flower that you use, the higher the THC in the resulting oil. To make sure you are making CBD oil that is exclusively CBD you will need to purchase flower that has little to NO THC count, such as Charlotte’s Web, or purchase hemp. To extract CBD you are going to typically use the whole plant – or aerial parts. Aerial means it is exposed to air – so no roots. Your CBD process will be the same as your THC process – the only difference is that the resulting oil will have no psychoactive qualities. Because CBD is totally legal, making CBD oil from hemp (not THC filled cannabis) is also legal and results in no legal ramifications for possession or manufacturing. It also has a host of medical benefits that many patients, and pet parents, swear by. Okay, into the more involved processes. BHO, Butane Hash Oil – sometimes referred to as Butane Honey Oil, was originally made through a process called “blasting” or “open blasting” which is really not done commercially anymore but is often the cause behind at home manufacturing explosions. This technique is outdated, to say the least. During the butane extraction process, gas passes through a tube open at one end, often made of glass, stainless steel or PVC, which is filled with cannabis plant matter. A low temperature, liquid butane passes over the plant matter, is collected at the other end and crystallizes the resins in the cannabis. The butane is then left to evaporate, by heat or vacuum oven, and what is left over is known as BHO. It is a hazardous process and wastes a lot of cannabis, making it not the most cost-effective way to create BHO either. When blasting, there is no way to contain the extremely flammable butane – so when you are open blasting any type of ignition can create an explosion. We will not be going to go into detail on how to perform open blasting, it is dangerous and we won’t be responsible for passing that knowledge along. However, blasting is not the only way to make BHO. Due to the extremely hazardous conditions caused by blasting, a new concept has been adopted – Closed Loop Extraction. And it isn’t just better because it isn’t an explosive technique – there are other reasons it is superior to blasting. In closed loop extractions, solvents are put into a pressurized tank which is connected to an extraction tube which is where plant materials are stored. Leftover, or residual, solvents then collect in a recovery tank. Solvents in the recovery tank can be stored and reused – so it is a very sustainable process as well. People are also debating whether or not consuming butane is safe. When you use a lighter to light a bong, pipe, joint or cigarette – you are inhaling trace amount of butane…but there has not been enough research done to say if butane consumption is creating long-lasting health hazards or not. Buyer beware. Supercritical fluid extraction of SFE is the preferred process for CO2 Oil extractions. What is Supercritical Fluid Extraction? During this process, components are separated using Carbon Dioxide or CO2. The word supercritical plays in because in chemistry, “supercritical” means “any substance at a temperature and pressure above its critical point, where distinct liquid and gas phases do not exist.” In this supercritical state, the product is able to be broken down and separated. Only then is it able to pass over cannabis plant matter and dissolve the membrane of trichomes and separate substances. CO2 extraction is capable of extracting THCA, CBD, CBG and THCV to name a few. CO2 extractions can also separate terpenes and other vital compounds in cannabis. The enriched CO2 solvent is then passed into another tank, a pressurized separation vessel, and changing pressures and temperatures are used to complete the process of separation. Remaining CO2 is restabilized into a gas and as we said above, often reused. Even the FDA recognized Supercritical CO2 extractions as safe for industrial extractions – not in cannabis of course, but for other botanical products and such. Distillation is used in the alcohol industry to remove methanol and ethanol used in alcohol production. It is the process used to separate compounds by utilizing their unique boiling points. It is used to purify cannabis oils by heating cannabinoids to their boiling point. The resulting cannabinoid-rich vapor is condensed and collected – while residual solvents, chlorophyll and other unwanted plant matter are left behind. This does remove most if not all of the terpenes in cannabis oil, however, as the temperatures are too high for the terpenes to survive the process. With that said, manufacturers are now playing with the re-introduction or terpenes to the oil after the process. The distillation method can be repeated multiple times in order to produce the purest product possible. RSO is easy peasy to make at home on your own and is not too much different than making cannabutter or other cannabis oils. Simpson’s recommendation is to use indica strains exclusively, but a patient can use whichever strain they prefer. Visit Leafly for the full recipe and process. Hope that answer your question about “how are cannabis oils made?” How do you smoke cannabis oils? Read on, friend, we are about to go there. The ways that you can ingest marijuana are plentiful. You can smoke it, vape it, eat it, and yes, even enjoy a marijuana drink it. That is what we gather here to discuss today: cannabis drinks. And trust us, learning about this interesting sub-niche in the world of marijuana is going to be just as much fun as it sounds. How big is the marijuana cannabis drink market? The marijuana drinks market is probably bigger than you would guess. In fact, it is projected to be worth $600 million over the next several years. Where can you buy marijuana drinks and wine? It sounds good, right? So where can you go to incorporate some marijuana drinks into your life? The answer can vary greatly depending on where you live. For example, if you live in Washington state, you might be able to go just down the street and head on over to the dispensary of your choice. If you live in Illinois, well, you are out of luck. You’ll have to take a weed vacation to Colorado or California just to get a sip. In other words, it depends on the laws of your community. Marijuana is becoming increasingly more normalized by our legal system with each year that passes, but there are still kinks. One of them is that each community has its own rules. Even if you are living in a community with legal recreational or medical marijuana, access to cannabis drinks may vary. What do these cannabis-infused drinks taste like? So, what do marijuana drinks taste like? Well, it really depends on the drink. Truly, it could taste like almost anything. The answer to that is mostly going to depend on what you are drinking. But if what you want to know is if it will taste like marijuana, the answer is that it doesn’t necessarily have to. Wine and weed sound like the makings for a lovely Friday night, doesn’t it? Weed and wine are a natural combination and now they are more combined than ever. Let’s explore this wonderful pairing a little bit, shall we? How long have people been mixing wine and weed? Cannabis and wine have both been around for recreational use for quite some time. People have also been enjoying them simultaneously for many years, with marijuana in one hand, and a nice chianti in the other. But when did the bud find its way into the drink? It looks like the combination is quite a bit older than you might guess. In fact, there is a history of cannabis-infused wine being used in religious and meditative practices that stretch back centuries. In modern times, weed and wine are still being used to get in touch with your higher self, though not with the same degree of formality that the practice used to have. Still, if you do want to pick up some cannabis-infused wine, it turns out that you will be carrying on a longstanding tradition! Now, in California, you can even get weed and wine tours that will allow you to survey the regions rich offerings of both bud and grappa. Though not a religious pairing anymore, weed-infused wine still has a strong future ahead of it. Now that you know a little bit about the history of the pairing of wine and weed, let’s talk cannabis wine. Marijuana wine is, of course, made through an infusion process. The process is actually somewhat similar to how you might make tea. The cannabis is first decarbed to restructure the molecules to promote the psychoactive effect of THC. This is done through the application of heat. The marijuana is then transferred into a material that will allow it to slowly seep into the wine. Let’s now take a look at the different types of cannabis wine that you might expect to encounter. Cannavines is a company that makes canna wines, as it were. It’s a play on words but you get the point. They specialize in wines that are derived from cannabis. Their main ingredients are actually terpenes and CBD. CBD wine is going to have all of the benefits of CBD (which we will discuss a little bit later) mixed with all the fun of wine. Which you are probably already aware of. The nice thing about CBD infused wine is that it enjoys somewhat broad legality. The legality of marijuana-infused wine is a little bit complicated. The legality of hemp infused wine is not so complicated. To put the matter in perspective for you hemp wine is being manufactured in Texas, a state that has some of the most complicated cannabis laws in the country. But hemp also isn’t marijuana. It’s a cousin plant, and it has a wide range of applications. Hemp wine does not contain any THC and will therefore not have the same psychoactive effect as marijuana wine. CBD is also non-psychoactive, but it does contain very small amounts of THC. To be clear, the levels of THC in CBD wine are so small that they won’t show up on a drug test. CBD is however associated with promoting a feeling of relaxation. It also has lots of other potential health benefits. THC wine is probably what came to your mind in the first place when we first started talking about cannabis grappa. THC is the psychoactive component of the marijuana plant, which means, of course, that it will have the intended recreational effect when paired with wine. Non-alcoholic wine is exactly what it sounds like. It may sound a little bit paradoxical to take out the alcohol and add THC or CBD but this approach is definitely the most legally uncomplicated way to get marijuana-infused wine. A lot of people call sparkling wine champagne. It all depends on the region the bottle comes from. Regardless of what you call it, the beverage will be carbonated and sweet. But then again, you will probably be more focused on the THC compared to the bubblies. There are also other types of marijuana drinks to keep in mind. Let’s take a look. Marijuana tea is a classic combo. There are companies that make this product, and methods for going about doing it yourself. The combination is fairly natural, really. Tea is, after all, just dried leaves in hot water. You can get cannabis tea in just about any flavor you can think of. Sounds like a fun potion almost doesn’t it? Not exactly something that you would find in a Harry Potter book though. Dixie Elixirs is a company that has really taken a keen focus on this niche. They specialize in balms, lotions, and a variety of other wellness treatment products. There actually are proven benefits to using cannabis in this way. For example, elements of marijuana can be very good for your skin. You aren’t going to see Coca-Cola rolling out cannabis soda anytime soon. However, that doesn’t mean you can’t find a tasty, bud infused drink. Tinley and Legal Sodas are both companies that focus on making tasty, marijuana sodas. The flavors are about as diverse as you could imagine. You get traditional soda tastes, and also fun options, like alcohol-free margaritas. Coffee and cannabis are another classic pairing. Mixing stimulants with relaxers is a little bit controversial insofar as the fact that you just never know exactly what will happen. Coffee and cannabis might be relaxing, or it might be overly stimulating. Either way, you are free to roll the dice as you like. Marijuana-infused coffee is available in both traditional and cold brew. CBD is THC’s sober cousin. There are actually loads of proven health benefits for CBD that could have a bright future in the world of medicine. Let’s explore the world of CBD drinks, shall we? What makes CBD drinks different than THC? CBD or cannabidiol is not a psychoactive substance. It won’t get you high, but it will allow you to enjoy a lot of the other benefits of marijuana. It can reduce anxiety, treat inflammation, and possibly even slow the growth of cancer cells. CBD is actually legal in all fifty states. However, each state is able to make their own rules. For example, there are some states where CBD is only legal if it derived from a hemp plant. Still, CBD infused drinks will be more broadly available than the marijuana alternative. This is where things get a little bit complicated. Cannabis and alcohol are both federally controlled substances, and while alcohol is legal on a federal level, cannabis is not. This makes the legality of weed-infused alcohol very tricky. Let’s try and break it down. So here is the situation. Marijuana cannot be sold on the same premises as alcohol. Here are a couple of quotes that explain this. However as Forbes pointed out, there is a small degree of wiggle room. In other words, you can have THC in a non-alcoholic drink or alcohol in a non-THC infused drink, but never the two shall meet. At least not as the issue currently stands. If you would like a really in-depth explanation, here is a video that breaks it down. California really laid down the law regarding weed-infused alcohol recently. The state recently published an explanation that cannabis pubs and marijuana-infused alcohol would remain illegal. Can cannabis-infused alcohol be served anywhere? The short answer is, no. For as long as pubs and THC remain separated by the justice department, you won’t be able to get served a drink that combines the two in public. State representatives are making simply declaring that it is again federal law and they intend to follow it.